Rotor Film actually covers most aspects of film and television production, including visuals such as DCP mastering, final grading, motion graphics, dailies workflow, etc. 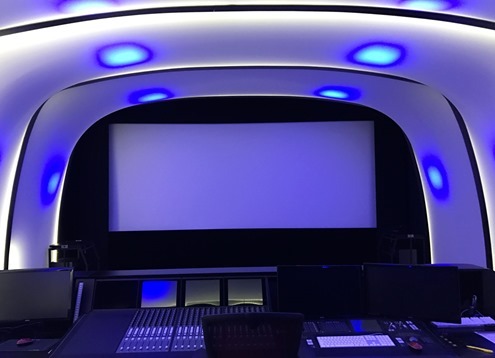 But of course, to us, the most interesting part is the audio production that also covers many different aspects, including sound mixing for cinema and TV for a wide range of formats such as 5.1 and 7.1 surround and immersive audio formats such as Dolby Atmos, Auro-3D and AuroMax. Further, Rotor Film can also handle sound design, editing and re-recording, ADR and dubbing, foley and overall project management. 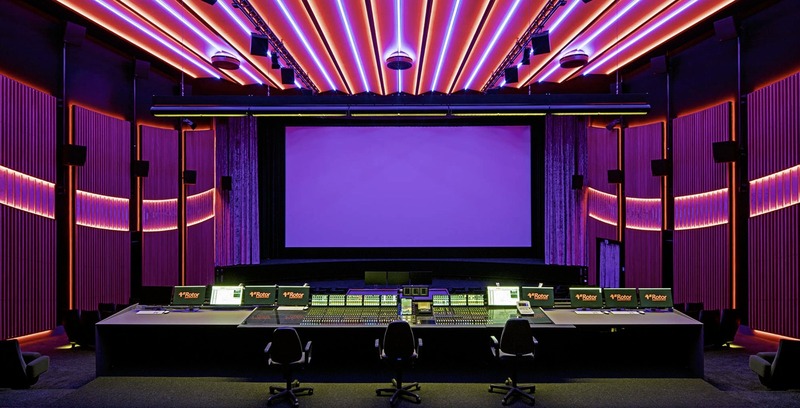 In total, the Rotor Film facility holds three main mixing stages, as well as three grading suites and eight editing suites, which allows them to work on many different projects simultaneously. And especially the mixing stages have a very nice and cool look and feel. For instance, Studio D has carefully tailored fabric on the walls, but the speakers in the room that are hidden underneath are all equipped with a lighting solution that allows you to keep track of where they are actually located. Among the clients you will find a plethora of high-profile German and international film productions, and when you have a track record and as tightly a populated list of services as Rotor Film does, then you also need the best equipment available across the board. And not least, you need the ability to handle a lot of audio signals of different formats that go back and forth behind the scenes of their main mixing theater – Studio F.
And that is exactly where AX32 and DX32 fit right in, taking on central interfacing and not least conversion roles in a very large and complex studio design. We were fortunate to be invited to the facility by Technical Director, Christoph Engelke, for a tour and a closer look at the technical setup first-hand, so let’s dig in and learn more about the technical setup in this very impressive mixing stage. Even considering the space that has been allocated for the large mixing area with the console, the mixing cinema has around 200 seats at the front that sometimes are utilized in connection with big presentations. 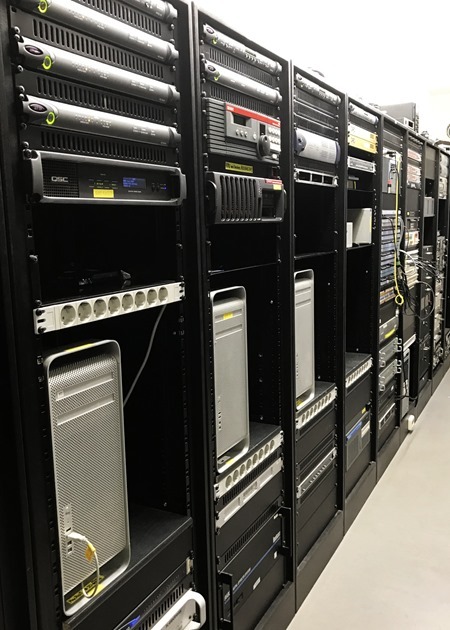 In the machine room, we find no less than four Pro Tools systems: A main playback system that runs HDX2 plus an additional playback system running HD native, and on the other side, two dedicated systems act as recorders – one HDX32 and one HD native. 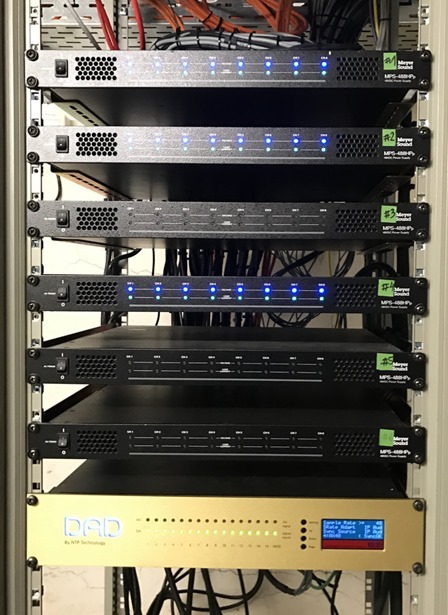 The audio-routing and monitoring system is quite complex and as part of the ‘engine’ Rotor Film has two AX32 and two DX32 units that play central roles in D/A conversion as well as D/D conversion between the MADI and the Dante IP Audio format by Audinate. Particularly for the D/A conversion, Rotor Film was looking for a solution that would provide not only the best possible digital-to-analog conversion, but also one that provided a massive headroom, as the active Meyer Sound loudspeakers they pass the analog signals on to require exactly that. On for instance JBL speaker that are passive, you would have an amplifier in between where you can raise the gain structure, but for these active speakers you need to be able to ‘feed’ them with a strong, high-quality signal. And AX32 turned out to be the perfect device for that task, delivering on both the high-quality Dante-to-analog conversion and at the same time offers plenty of headroom. One of the AX32 units converts 32 channels that go to all of the subwoofers, as well as the speakers located behind the screen in the mixing theater, while the second AX32 unit converts 48 channels going to the remaining surround satellite speakers in the room. Rotor Film still do have a nice collection of outboard gear, such as reverbs from Lexicon and TC Electronic, but generally their workflow is moving towards ‘mixing in the box’. One reason for that is that they sometimes rent their large mixing stage to other production companies, who don’t have an Atmos stage, but this way it’s easy for them to prepare their sessions and quickly get up and running in one of Rotor Film’s rooms. A large part of a ‘mixing in the box’ workflow is of course the use of various plug-ins. And as we all know, there are thousands of them out there. Christoph Engelke explained to us that they had decided to buy a host of the most popular ones, but there was no way they could have every plug-in installed. Quite simply, when you rent a room, you can use everything, but if you have a specific plug-in at your own facility that you would like to use that is not already installed, the customer can simply bring their own iLok USB key and then they are allowed to install the plug-in on the Rotor Film system to use on that particular project. 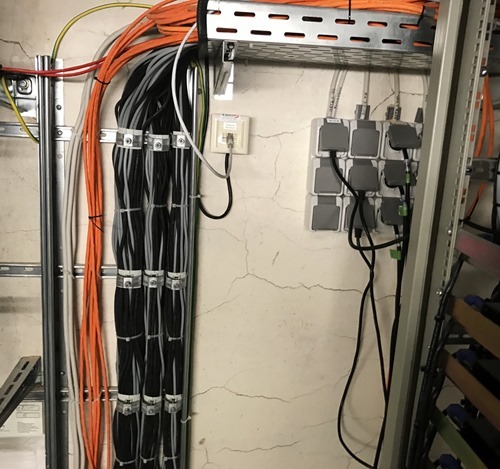 Even though we may be talking about ‘mixing in the box’, you still need a lot of cables for connecting the entire system. And in the machine room that holds the AX32 that converts for the 48 satellite speakers in Studio F, we find out just how much copper you need to keep the mixing stage running. But as expected, everything was neatly organized and strapped up nicely. In short, the impression that met us at first was that Rotor Film is a running a very tight operation lasted throughout our visit. And we’re proud to be part of a facility that provides top-quality results and solutions for their customers. Conversion may only be one process in a large production machine, but being able to trust what you hear is indeed helping in making the right mixing decisions, which will ultimately benefit the cinema audiences and their overall experiences. Quite simply, high-quality conversion matters!